Consideration should be given to official guidance on the appropriate use of antibacterial agents. Escherichia coli, Haemophilus influenzae, Staphylococcus aureus, Streptococcus haemolyticus, Morax-Axenfeld, Klebsiella/Enterobacter species and others. Chloramphenicol is indicated in adults and children. Adults, children and infants: The recommended dosage for adults, children and infants of all age groups is a small amount of the ointment to be applied to the affected eye every 3 hours or more frequently if required. Treatment should be continued for 48 hours after the eye appears normal. Elderly: As for adults. Chloramphenicol has been used successfully at normal dosages in elderly patients. The pattern and incidence of adverse effects does not appear to differ from younger adults. Dosage adjustment may be necessary in newborn infants because of reduced systemic elimination due to immature metabolism and the risk of dose-related adverse effects. The maximum duration of treatment is 10-14 days. Topical administration to the eye only. • Patients who have a history of hypersensitivity to chloramphenicol or to any of the excipients. • Patients who have experienced bone marrow suppression during previous exposure to chloramphenicol. • Patients with a known personal or family history of blood dyscrasias including aplastic anaemia. Chloramphenicol is absorbed systemically from the eye and systemic toxicity has been reported. Bone marrow hypoplasia, including aplastic anaemia and death, has been reported following topical use of chloramphenicol. Whilst the hazard is a rare one, it should be borne in mind when assessing the benefits expected from the use of the compound. 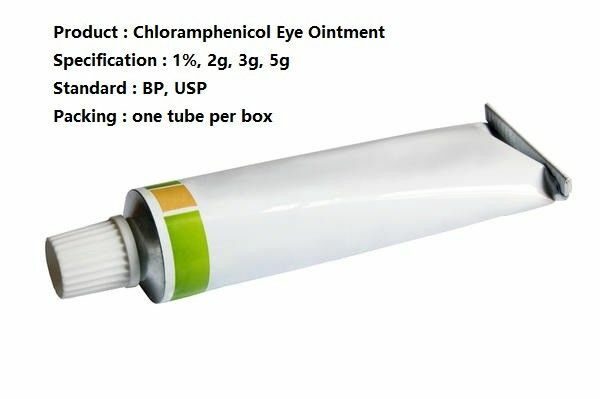 If the eye ointment is to be used on a long-term or intermittent basis, it may be advisable to perform a routine blood profile before therapy and at appropriate intervals thereafter to detect any haemopoietic abnormalities. In severe bacterial conjunctivitis and in cases where infection is not confined to the conjunctivae, the topical use of chloramphenicol should be supplemented by appropriate systemic treatment. Chloramphenicol does not provide coverage against Pseudomonas spp. or serratia marcescens. The use of topical chloramphenicol may occasionally result in overgrowth of non-susceptible organisms including fungi. If any new infection appears during treatment, the antibiotic should be discontinued and appropriate treatment given. It is recommended that all types of contact lenses be avoided during ocular infections. Do not use for more than 5 days without consulting a doctor. Medical advice should be sought if there is no improvement in the condition after 2 days or if symptoms worsen at any time. • Suspected foreign body in the eye. If you wear contact lenses, seek advice either from your contact lens practitioner (optician, optometrist) or doctor before you use this product. You should not wear your contact lenses during the course of treatment. If you wear soft contact lenses do not start wearing them for at least 24 hours after you have finished using the eye ointment.